Everyone knows Timex. They make watches that takes a licking and keep on ticking, or so the commercial from back in my youth liked to proclaim. The company also has the honor of being the only American watch maker to survive the digital revolution of the 70s. They adapted quickly to the new technology and with aggressive marketing and pricing were able to keep afloat in a sea of inexpensive Asian watches. I've owned at least one Timex watch that I can recall. A digital Ironman that I bought a few years back. It was a decent watch and I'm sure I would wear it occasionally today if I knew what happened to it. It seems to have disappeared, most likely hiding out in a box somewhere waiting to be discovered. But that's ok, it deserves its rest; for the longest time it was my only watch, and it served me flawlessly. I haven't thought much about Timex lately. Well, that's not true. I have thought about them, but in a dismissive sort of way. I regarded them as an ultimate poor man's watch, not meant to be admired, but rather to be worn for the purpose of telling time and very little else. This won't be the fist time that I've admitted I was wrong. One of the things that I really like in a watch is its ability to be seen in a movie theater. I like movies and I think it's only natural that I would, on occasion, want to be able to see the time. All my other watches, despite whatever fancy luminous material they use, are drop dead pitiful in this regard. Many of them do glow very strongly, but do so only in complete darkness where my eyes have had a chance to adjust. They glow through the night, and that's just fine. But in the movie theater, it's a different story. A movie theater isn't night; far from it. While there, I spend most of my time looking at a bright screen and occasionally I struggle to see the time. My eyes are adjusted to the very bright screen and the ambient light in the theater is such that the glow of whatever watch I'm seeing is near if not entirely invisible. There's a lot of turning my wrist, trying to catch a good reflective angle in order to make out the hands. What this exercise really amounts to is me missing the movie. While walking in Wal-Mart the other day, I came across a display of those $10 specials. I think that some of the mid-brand watch makers out there can take some lessons from these guys. While the watches were obviously made of inferior materials, the construction itself was outstanding. The machining was excellent, markers lined up, and hands ticked where they should. It's hard not to be impressed. One of the $10 specials was an quartz analog watch that had a nice white face and dark hands and numerals. It's the kind of classic look that I really like. I picked it up and fiddled with it a bit. That's when I discovered that when you push the crown in, the whole face lights up. My old Ironman Timex did the same, of course, but I've never seen it on an analog watch. I thought about buying the watch. At $10, it's hard to go wrong, but I didn't go through with it. I couldn't bring myself to buy a low-cost unbranded watch that was sitting in the middle of very light-weight and brassy-looking watches. 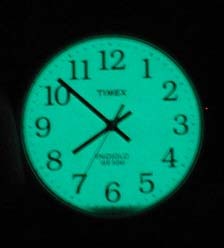 What I did do is ask around on one of my favorite watch forums if anyone knew of any quality watches that featured electroluminescent displays, the technology used to make the faces of watches glow. A few familiar names were thrown out. Timex, of course, and Casio. Also thrown out were Citizen and Seiko. I don't know what is about Casio, but I've never run across one that I actually like. They are either too big and bulky, or they are full of printing such as Sports 200 and Multi-Time Zone, all in big bright letters. Not much to my taste. Citizen and Seiko know watches. I have a couple of each and they run well and look nice. Unfortunately, as the features start to pile on, so do the looks. Not in the over-labeled Casio way, but in the shiny and sparkly way, using markers and hands that have weird futuristic curves. Call me an old fuddy-duddy, but I like traditional. Besides, I never did find a Citizen or a Seiko that was a plain-old three handed watch that just happened to glow when you pushed in the crown. That left Timex. My first response, as I said before, was dismissive. But then I started to look at their web page. There were actually some very nice plain watches, reminiscent of the cheap one that I was looking at earlier. And as far as electroluminescence went, it was a no-brainer; these were the guys who pioneered the technology and called it Indiglo. I found a watch that I really liked, the 20501. At Timex's website, it costs $30, but I was able to pick it up at the same Wal-Mart where I saw the $10 special for only $20. Seemed like a steal to me. I will say that the 20501 isn't high-quality, but it isn't low quality either. It is obvious where corners are cut, but to Timex's credit, they tell you this in an up front sort of way. For example, on the back of the case it says that the case back is made of stainless steel, but it also tells you that the rest of the watch is made of base metal, although it doesn't go into detail about which metal that might be. It makes sense that the back needs to be stainless steel; wrists do sweat, after all. The band is similarly honest. It states "genuine leather upper," which means that only the part of the band that people get to see is really leather. I don't know what the back is made of. The band, aside from being half leather and half not, is very pliable in what I would almost call a luxurious way. Touching it reminds me of my lambskin leather jacket, which I will confess that I sometimes touch just because it feels so nice. The buckle on the end is plain, but not unattractive. The face of the watch has a classic look to it. White with large and easy to read dark black numerals along the perimeter. The numerals are in a serif style font, which I also like; it has a dress-watch elegance to it. The hour and minute hands are thick and black and end flat, rather than with a point of some sort. I'm not sure if I like the abrupt ending to them all that much. 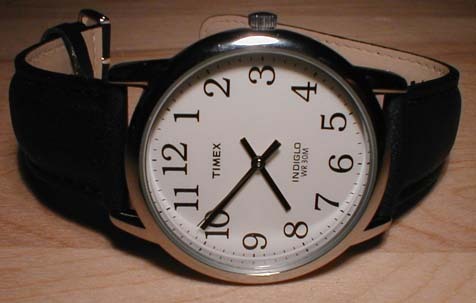 The second hand is chrome, and I think that shows some excellent design-work on the part of Timex. One of the things that I have complained about other brands, such as Invicta, is that on many of their white face models they will use chrome hands. My complaint is that chrome hands completely disappear into the watch, making reading the time difficult. On the Timex, this is to an advantage because most of the time you don't care about the seconds, so having it effectively disappear is a good feature. Of course, it's there if you need it, you just need to stare at the watch for a fraction of a second longer in order for your brain to pick it from the background. Speaking of the hands, Timex actually got something right that many other watch makers either get wrong, or don't care enough to try to get right. The hands line up. When it is 12 o'clock, both hands are perfectly straight up. And that second hand, while I'll be darned, but it ticks exactly on the second markers. I've seen quartz Omegas that don't even do that. The back of the watch says the movement was made in the Philippines. That's fine--as long as it keeps time and works right, I don't really care where it was made. So far it seems to be doing both of those perfectly. It does have a tendency to be loud, however. I'm not sure I can describe how loud it is, but if your hand is within a foot of your ear and the TV is in the background, you'll still hear the watch. Moving your hand away from your ear, of course, fixes this. Because the tick is so loud, I will tell you that it's a quality tick that reminds me of being in an old house with a grandfather clock. That is most likely the only tick-sound review you will ever get from me. I probably don't need to say that the crown isn't screw down and it's certainly not signed. It's small and it works, just like everything else on this watch. The dial tells me that this watch has a 30M depth-rating, which means you can get it wet without any problems. I'd be sure to dry that band off though. Pressing the crown in causes the whole face to glow. This is why I bought the watch. The glow is even over the entire surface, except at the very bottom, which I suspect is where the electrical connection is made. The glow is very bright. Bright enough to read by if you had to, although you wouldn't want to. I don't know what the crystal is, much to my chagrin. I will rule out sapphire immediately. I believe it is probably glass, but it could also be plastic. The tap-it-with-a-metal-thing reveals a sound that my ears can't discriminate. I'll post an update here when and if it gets scratched. My only real concern with the watch is its potential for longevity. I haven't opened it up to see what makes it tick, but my understanding is that if I were to do so, I'd find a lot of plastic moving parts in there. I'm not sure if this worries me or not. Plastic is, after all, pretty durable and we're not exactly dealing with a lot of torque. The wear factor is probably minimal. I'll also post an update when and if the thing ever stops working. I really like this watch. I spend a lot of time talking about and trying to justify the value one gets when spending hundreds of dollars on a certain brand. With this Timex it's not even debatable. For $20 you get a watch that works well and is attractive to boot.